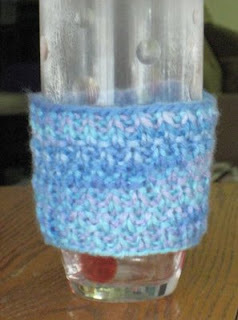 I want to quit my job and knit dish towels and cozies all day. I'm trying to decide whether to shut off my HBO subscription. I need to cut costs and my two favorite shows, Big Love and Flight of the Conchords, are finished for the season. However, I love Real Time With Bill Maher. And how much will I really be saving? $10 a month? There are many television shows that you can watch online, perhaps I can find Bill out there somewhere. I think I could manage, albeit reluctantly, to do away with my cable package in its entirety (well, just basic) and cut my bill to close to nothing. However, I cannot live without the internet. That's my crutch. I may be reduced to eating ramen noodles and hotdogs, but I'm going to have the ability to wiki or google whatever pops into my head. And don't even get me started on Facebook. My second attempt at the cozy is greatly improved. I can knit this thing in one evening. 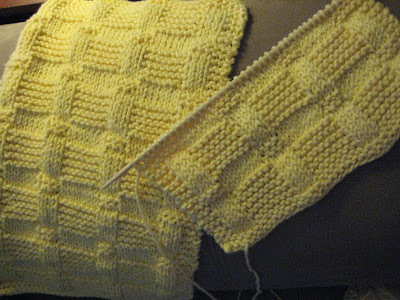 So, send me your addresses and I will mail you each one (at least until I get bored with knitting this). Today, I went to my first real yarn store, Sip and Knit. It was very relaxing. But so expensive. The yarn was so beautiful and the fibers were so soft. What a luxury; too bad my financial picture does not support me purchasing yarn at $11 per skein. Back to my house (with my Michael's yarn stash), I am getting hang of knitting in the round. 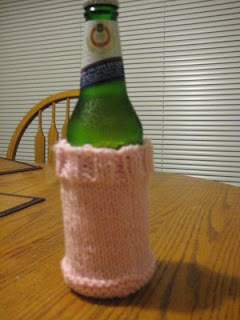 I just finished my first soda can cozy. The free pattern can be found here. I don't drink soda at home, so I had to go with a beer for posing purposes. I'm in the process of transferring my 401(k) from two former employers to an IRA. So much paperwork! 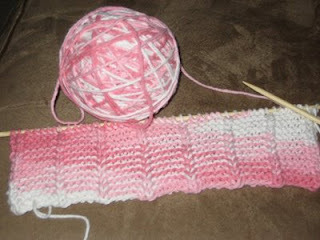 I started a new dishcloth, mostly because the pattern is simple but pretty. What else am I going to do with the yarn? I finished my scarf, just in time for the Florida cold weather. I'm through with scarves (famous last words). I've been knitting for 10 months now, but I think I need to branch out and keep challenging myself. I'm getting into a rut with all the rectangles. 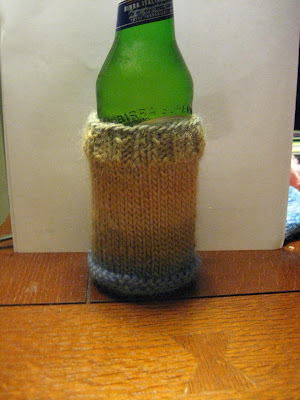 So I'm going to print out and prepare myself for knitting socks. There is a pretty decent (free) tutorial online, recommended by many, at Silver's Sock Class.